We are a gay and inclusive club that welcomes anyone who loves football – gay, bi or straight. We play in the FAI Leinster Football League and take part in small-sided leagues and tournaments both at home and internationally. Follow our progress on the pitch, see our future plans and then click the link to come Join us. We have a welcome for all our members, both old and new. All levels of skill and ability are catered for with highly competitive teams and social leagues running in tandem, throughout the year. Our Membership year runs from January to December and our Membership subs are €40. We are thrilled to have incredible backing from Sponsors The George, who not only support us on the field as our playing kit sponsor, but also support us off the field as venue for our headline and social events. We also remember our original sponsor Spice who supported us in the early years and The Front Lounge who also supported our development as a club. The Devils primarily are a football team and it is for that purpose that most people initially come along. However, the social side to the Devils is just as active. 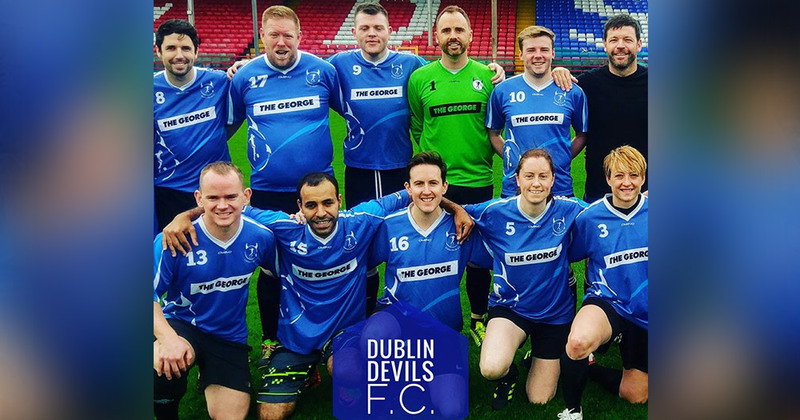 We are permanent fixtures at such events as the Dublin Pride Parade and Pride Sports Day, and our annual Oscar Wilde Cup Challenge against the Emerald Warriors RFC takes place in August each year. We also regularly get together as there is always a birthday or some other special event to celebrate! Many close friendships have formed within the Devils over the years and it is a great way to meet new people in a relaxed atmosphere, and you will nearly always see a fellow Devil along the bar from you on a night out. It is also a very relaxed way for guys exploring their sexuality to come along and play some football and see how they get on. You are assured of a very friendly welcome from all our players in a very relaxed environment – well, until the whistle blows for kick off and then it’s game on!!! We have weekly training, organised by a football coach with over 30 years’ experience at all levels of the game. There has been an upward shift in fitness and skill levels for all participants and our mental and tactical game has also improved immensely in the last year, allowing us to achieve greater heights than ever before. Another very enjoyable element of the club is our trips away. Over the years we have been all round the globe playing in both organised International Tournaments such as the IGLFA World & European Championships and Gay Games, and also in friendly games against some of the best teams playing weekly in the UK GFSN League. We have visited places such as Washington, Chicago, Cologne, London, Manchester, Leeds, Edinburgh, Glasgow and Munich. The trips are a great way to really get to know the other players and build a strong team bond. We also welcome other teams to Dublin and have welcomed the Leftfooters and Phoenix FC, both teams from London.